There are thus far 8 new teachers who have been hired this year at Sakkara school, in Cairo. We all arrived within a week or two of each other, and due to the fact we are all living within the same few blocks in Maadi (a fairly upscale suburb of Cairo - though upscale in Egypt means something slightly different than in North America), have become instant friends. Yasmin - the first to arrive. Half Libyan, half British, with a very thick awesome proper British accent, Yasmin studied Arabic in Cairo for a year while at University, and has also spent a few summers here. 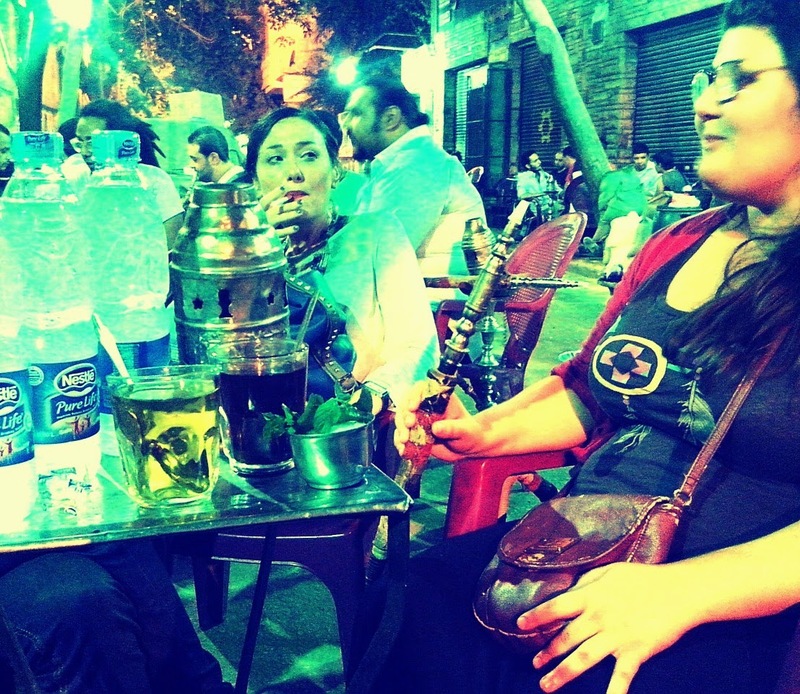 She quite obviously loves Cairo, has a great sense of humour and also loves chain smoking while drinking Stellas. Rebecca - Yasmin's flatmate, Rebecca is an experienced teacher who has spent the last 10 years in various locales from Japan to Chile. She is originally from Georgia, USA, and has a lovely Southern accent, as well as a very feminine, beautiful sense of style - sort of Southern belle meets boho traveler. Our first night out, she navigated downtown Cairo's maze of uneven and crumbling streets in a pair of wooden platform strappy wedge heels. I was very impressed. Rebecca is a vegetarian, a shameless smoker, and a fellow aspiring writer, who studied photography at University. She was originally planning on going to Afghanistan to teach, but much to her fathers relief, chose Cairo instead. I think me and her are going to get along fabulously. Michelle - Originally hailing from sunny California, Michelle is a super funny and friendly hip girl, who happened to study Arabic for a semester in Cairo, and of course, fell in love with the city. She is self professed to be obsessed with Urban renewal/decay and megalopolis cities, and is intrigued by the contemporary fusion of cultures and lifestyles that cities like Cairo encompass. Michelle is very confident in stressful chaotic urban situations, and has been a sort of tour guide to us girls who aren't as familiar with the city. She is hilarious and always cracking jokes, I like her a lot. Tresta - The last of the girls to arrive, Tresta happens to have a very unique name that also happens to be very similar to my friend (who also came to Cairo with me), Tressa. We are all slightly amused by this coincidence. Tresta, from Florida, spent the past 2 years living in India, volunteering for an NGO, and teaching kids. She is very feminine and well spoken and calm- though she seems to have plenty of interesting stories too, including something about a broken engagement to a German man while in India. This is her first time in Cairo. Hannah - Hannah originally hails from Montana, USA, so naturally we initially refered to her as Hannah Montana, though I don't think she appreciated it so much. She has her degree in Arabic, and spent a year or two living in Alexandria, Egypt, before coming to Cairo. Her and her flatmate Linea (from Alaska, USA), are long time University friends and have spent a fair bit of time to themselves, so I don't know them as well as the others, yet. They both seem very polite and quiet and reserved, though if they love Egypt this much, I predict they are fairly different people once you get to know them. And then there's me and Tressa, the 2 Canadian girls. I am not sure what people might say about us - the 2 loudmouths who talk a lot, one of whom is obsessed with the region, the other who came along for the crazy ride, both of whom love hummus and make somewhat inappropriate jokes about the old, run-down vintage dive bars full of drunken old men, in Downtown Cairo, in front of the schools Director. Whoops.